Naypyitaw, 23 April 2015 – Participants at a workshop recently held in Naypyitaw agreed upon the initial vision for a “climate resilient, low-carbon, resource efficient development, as contribution to sustainable development of Myanmar”. The 1st Workshop for the Formulation of the Myanmar National Climate Change Strategy, Action Plan and Policy had participants from all relevant ministries of the Republic of the Union of Myanmar, as well as Civil Society and NGOs; the Academia; the European Union, the United Nations Human Settlements Programme (UN-Habitat) ,the United Nations Environment Programme (UNEP) and other international organizations. 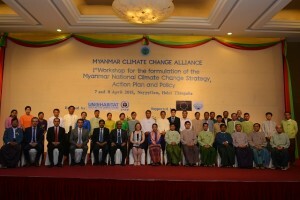 The workshop was organized by the Mya nmar Climate Change Alliance Programme (MCCA). The MCCA Programme is funded by the European Union and the United Nations Human Settlements Programme (UN-Habitat) and United Nations Environment Programme (UNEP) supports the government in implementation.. Its purpose is to support the country in raising awareness of climate change; to create the institutional, policy and technical capacities to address climate change; and demonstrate at the local level climate change adaptation methodologies. 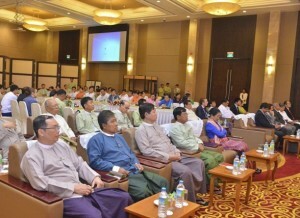 Myanmar’s Deputy Minister for Environmental Conservation and Forestry, Dr. Daw Thet Thet Zin, opened the formulation workshop by expressing the country’s steadfast commitment to addressing climate change, as an integral part of Myanmar’s sustainable development and in line with its global commitments. Representing the European Union, Ms. Delphine Brissonneau emphasized that “in Myanmar, the momentum of reform and possibility for rapid growth means that there is a unique opportunity here to encourage a low carbon development model and ensure climate change adaptation and mitigation are well mainstreamed so that precisely this growth and development the country is striving for is not undermined and compromised”. Participants drew upon th e experience of neighboring Thailand, whose climate change strategy was presented by Mr. Prasert Sirinapaporn from the Ministry of Natural Resources and Environment. Mr. Bijay Karmacharya, Country Programme Manager of UN-Habitat , highlighted how the current and future effects of climate change can only be addressed through actions coordinated across key sectors – for instance, Agriculture, Energy and Transport – by state institutions, civil society and private sector actors and development partners. Importantly, UNEP Regional Climate Change Coordinator, Mr. Mozaharul Alam, stated that the Strategy and Action Plan represents a concrete and tangible instrument for Myanmar to achieve this kind of inter-sectoral cooperation and effectively address Climate Change. In Myanmar, socio-economic well-being is highly dependent on the environment. Devising a roadmap to address climate change is thus crucially important to the country’s sustainable development, and the agreement reached between the workshop’s participants is an important contribution towards this end.